It was realized yesterday that the transport driver allegedly smoked and drunk amid the travel and when advised by travelers, he undermined to deal with them.. 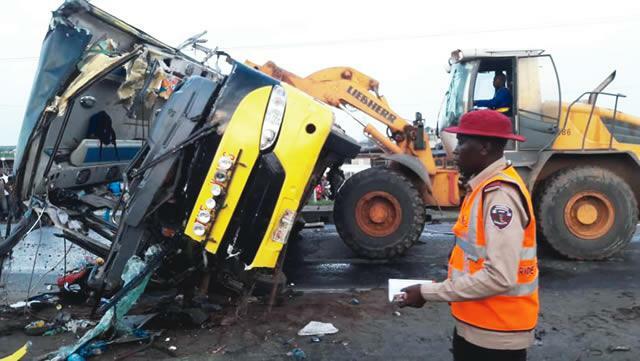 Some of the passengers allegedly called the telephone number of Young Shall Grow to complain about the driver’s recklessness, and the company reportedly promised to address the issue. It was gathered that when the passengers called back, the phone rang out several times before it was switched off until tragedy struck. The Punch had reported that about 42 passengers left the South-East for Lagos in the bus with number plate, SMK 867 XG. The bus driver was said to have rammed into a stationary truck around 5.30am on Monday, killing nine persons on the spot, while the 10th victim died in a hospital. One of the survivors, Godwin Ikechukwu, said the passengers left the Enugu park without any premonition that danger was ahead. He said, “We left Enugu in the night. Our bus was the third to leave the terminal. About 10 minutes after we left, the driver started driving recklessly and everybody on the bus were alarmed, telling him to slow down. The man did not listen to any of us; nobody was comfortable. “When I could no longer bear it, I decided to bring out my payment receipt ticket, checked the telephone numbers and found the customer care contacts of Young Shall Grow Motors. I called and told them our experience. I said the driver taking us to Lagos was driving recklessly and the company should caution him. They asked for the number plate of the bus and I gave it to them. They said they would take care of it. Ikechukwu said when the vehicle got to a police checkpoint, one of the females on the bus alerted the policemen, who ignored her. “She waved at the policemen to stop the bus, but the officers did not listen maybe because they did not understand what she was saying. Subsequently, whenever we approached any other checkpoint, the driver raced past them and refused to stop,” he added. The female passenger, who reportedly waved at the policemen, confirmed Ikechukwu’s account of the incident. Another passenger said the driver threatened them for trying to report him to the police. “After the woman tried to call the police, he asked us to identify the people on the bus who were against him. We told him nobody was against him and that we only asked him to reduce his speed. He said we should not allow him to do what was in his mind. We told him to reduce his speed or park, but he ignored us. He was under the influence. One of the female survivors, however, said contrary to the police claim that the driver died, he escaped. “While I was struggling to come out, I saw him. He said, ‘you people should stand up and come out.’ that was the last time I saw him. He did not die,” she said. An official of the transport company contacted by The Punch Wednesday declined comment.